After four years as an officer of the Maryland Returned Volunteers, this will be my last newsletter to you as President of the group. As many of you know, over a year ago Sunday and I scheduled a cruise to celebrate our 20th anniversary that leaves next week and we may not be back in time for the annual Christmas party so we thought that it would be nice to look back on the past four years and put together a personal scrapbook of some of the highlights of events sponsored by the Maryland Returned Volunteers that we will keep in our memories forever. 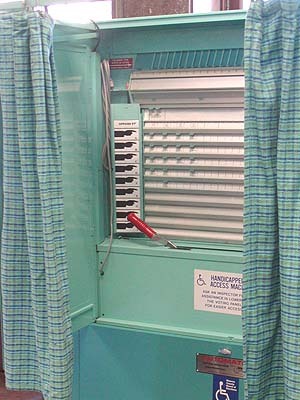 Look at the photos below and see how many of these you remember. Thanks everybody for four years of wonderful friends, activities, and memories. 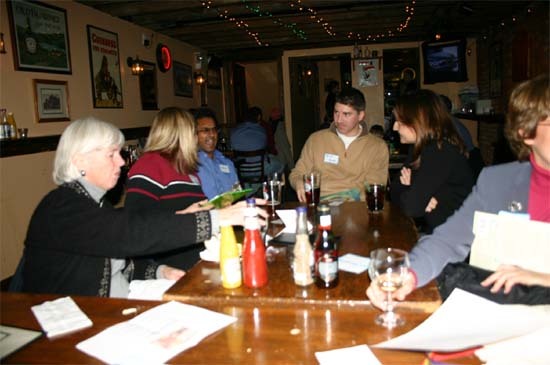 Don't miss the Holiday party on January 28 and the Planning Session on Febrary 2. Details and Directions are at the bottom of the lead story. See you there. 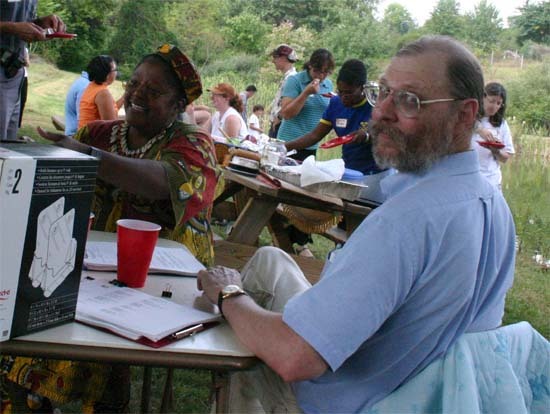 The group's first Peace Corps History series at UMBC was in 2003 with former Peace Corps Director Jack Vaughn (left). Summer Rosswog (left, seated), a graduate of UMBC's Peaceworker program welcomed us to the campus and C. Payne Lucas (right) introduced Jack Vaughn to the group. Of all the events the Maryland RPCVs have done over the years, this is the event that we are personally proudest of having been a part of and we will always cherish the memory of having had the opportunity to listen to and honor one of the most influential Directors in the history of the Peace Corps and finest men we have ever known. Read more about this event here. 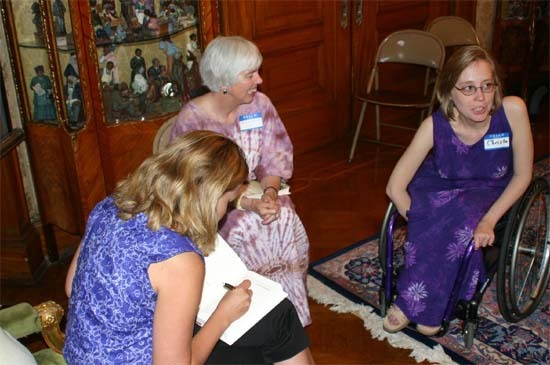 RPCV Author Sarah Erdman talks about her book "Nine Hills to Nambonkaha" at the group's Book Club Meeting in 2004 that was held in a Victorian brownstone in Reservoir Hill. Here Sarah (left) talks with members Kay Muldoon-Ibrahim and Christa Bucks-Camacho. 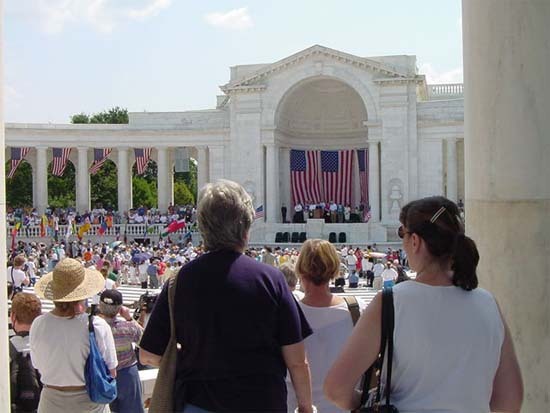 Members of the Maryland Returned Volunteers participated in the "Peace March" at the 2002 National Peace Corps Convention in Washington DC, and listened to speakers remember the Peace Corps Fallen at the Ampitheatre at Arlington Cemetery. Read more about this event here. 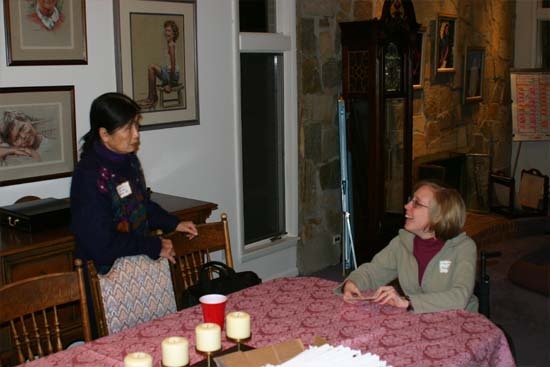 Treasurer JoAnna Allen and Secretary Christa Bucks Camacho address newsletters at the group's Christmas party at the Fittons in 2004. Note the (in)famous "Yearly Planning Board" in the background right. 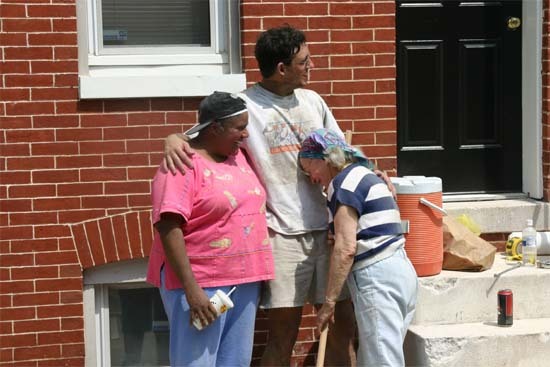 We were able to attend the NPCA Board Meeting in Miami in 2003 representing the Maryland Returned Volunteers and had the opportunity to see Gaddi Vasquez and Kevin Quigley speak to volunteers who were heading to Haiti. This is the meeting where the Maryland Returned Volunteers were honored to have the NPCA ask the group to consider hosting the Peace Corps' National Convention in 2006. After long and careful consideration, the group decided against taking on a task this large by itself. Read more about this event and an interview we had with NPCA President Kevin Quigley here. 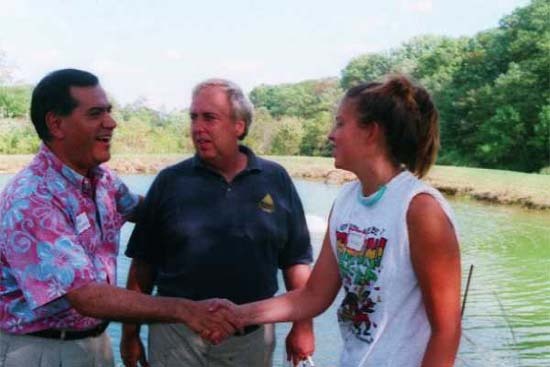 Peace Corps Director Gaddi Vasquez (left) spoke at the group's Picnic in 2002. Here he is talking with the group's host for the picnic Tom Jacobs and his daughter Geneve. Read more about this event here. 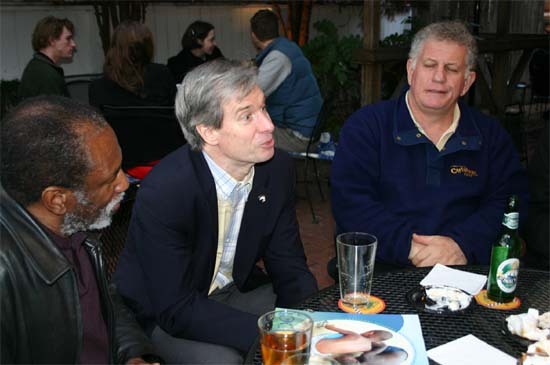 NPCA President Kevin Quigley (center) makes a point at a Happy Hour at the Ram's Head in Annapolis. 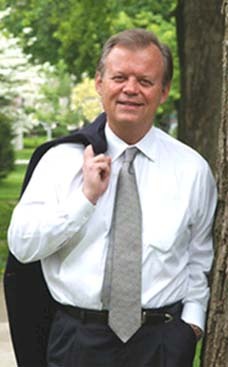 Kevin was the speaker at the group's annual picnic in 2003. Read more about this event here. 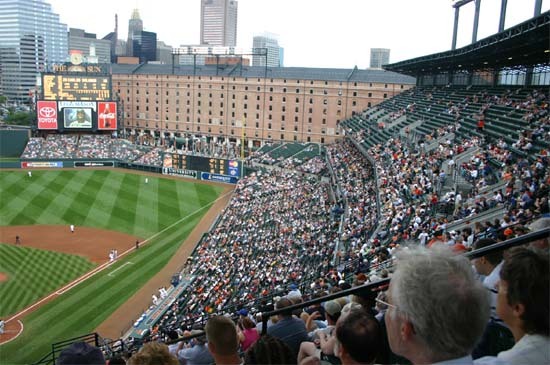 Joe Navarro organized an "Orioles Night" in 2004 when thirty Maryland Returned Volunteers attended a game together. 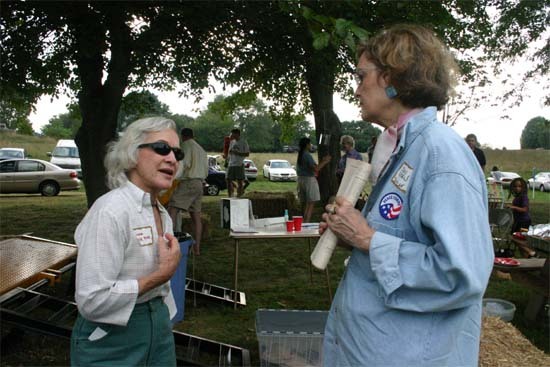 Deputy Peace Corps Director Jody Olsen (right) spoke at the group's Picnic in 2005. 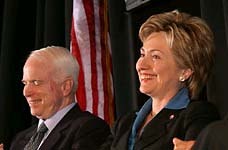 Here she is talking to one of the members of the group, Lane Berk, about the Peace Corps Military Option that was being much discussed at the time. 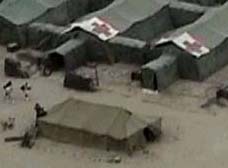 Members of the Maryland Returned Volunteers lobbied Congress to change the law - a change that was signed into law this past January. Read more about this event here. 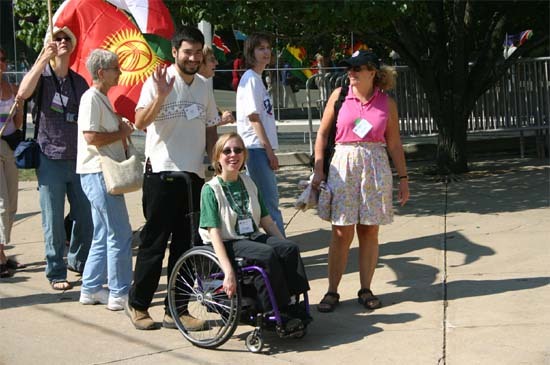 Christa Bucks Camacho and her husband Jose participate in the Peace March as part of the group's delegation representing the Maryland Returned Volunteers at the National Peace Corps convention in 2004 in Chicago. Read more about the Peace March, the Opening Ceremonies, the Closing Ceremonies and what Chris Matthews and Bobby Mueller had to say at the convention. 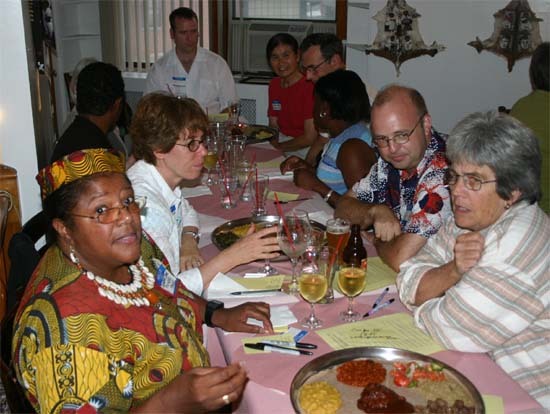 Returned Volunteers meet at the group's ethnic dinner at the Ethiopian "Dukem Restaurant" in 2004. Tracey Feild, JoAnna and Ken Allen, and Charma Rhoden enjoy an animated conversation at the meal. Tracey Feild organized this event that was one of our most successful ethnic dinners. Read more about this event here. 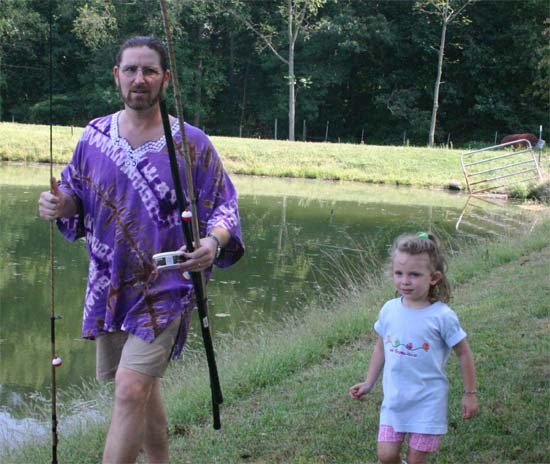 RPCV Author Mike Tidwell (right) baits a hook before he speaks at the group's Picnic in 2005. Mike, the author of "Bayou Farewell," and "The Ponds of Kalambayi: An African Sojourn" was one of the group's most frequent speakers talking to the group about Global Warming in 2002, sharing his home with the group in 2003 to show us his energy savings, screening his movie "We Are All Smith Islanders" at the Pratt Library in 2004 and speaking at the group's picnics in 2004 and 2005. Read more about this event here. 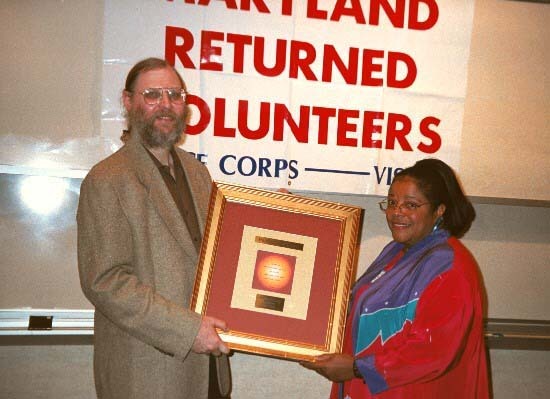 One of the proudest moments that Sunday and I shared was receiving an award in 2003 from the Maryland Returned Volunteers for publishing "Peace Corps Online." Read more about this event here. Scott Stossel, author of the biography of Peace Corps Founding Director Sargent Shriver, spoke at the group's second Peace Corps History series at UMBC. 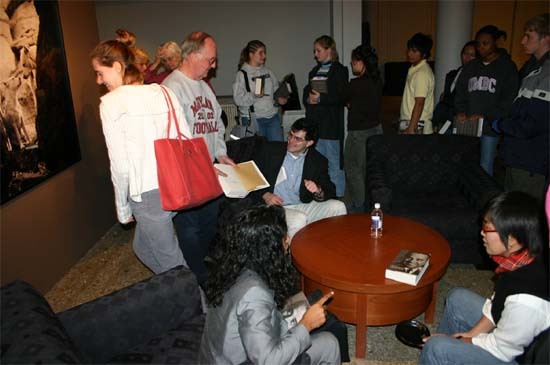 Here he is (seated center) at a book signing for "Sarge" after the event. Joby Taylor, head of the Peaceworker Program at UMBC, organized this event and it was one of the finest events the group ever sponsored. Read more about this event here. Read Scott's remarks to the group here. 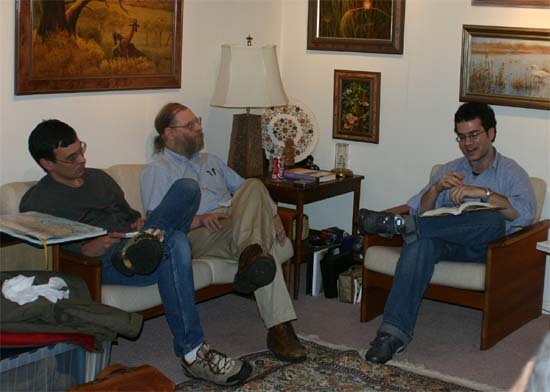 RPCV Author Tom Bissell (right) talks about his book, "Chasing the Sea," at the group's Book Club Meeting in 2003. Kay Muldoon-Ibrahim hosted this event at her home. 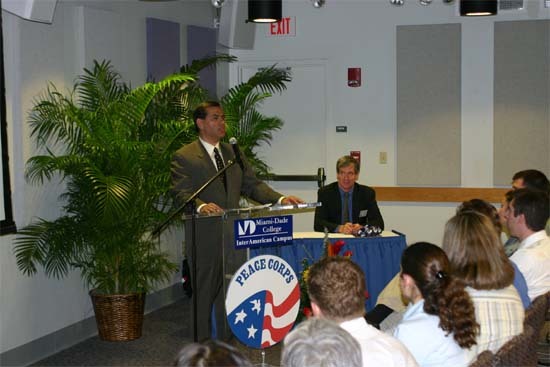 Author Philip Weiss participates in a panel discussion with three psychiatrists and a criminal lawyer during a discussion of his book "American Taboo" about the murder of Peace Corps Volunteer Deborah Gardner at the group's Book Club Meeting in 2005. Psychiatrist Marilyn Martin (center) makes a point while (left to right) Charma Rhoden, Joseph Permetti, Brian Dulay, Philip Weiss, James Crockett, Linda Robinson, and Sunday June Pickens listen. Read more about this event here. 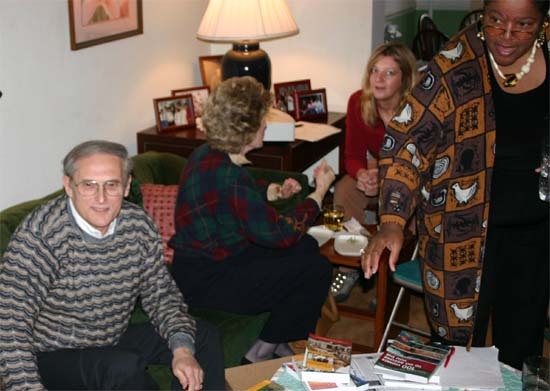 RPCV Author Ron Krannich talks about his books about international jobs, the book publishing business, How to travel for a living, and internet business models at the group's Book Club Meeting in 2005. 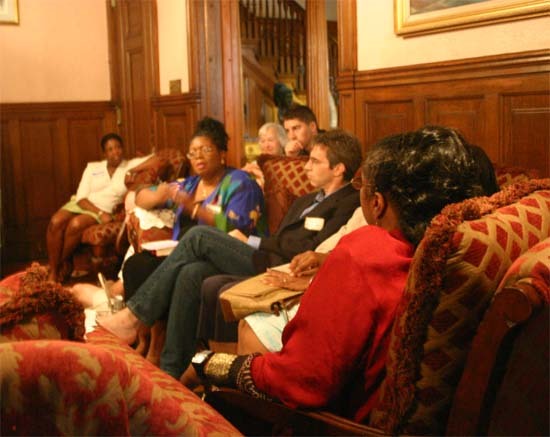 JoAnna Allen hosted this meeting at her home. Read more about this event here. 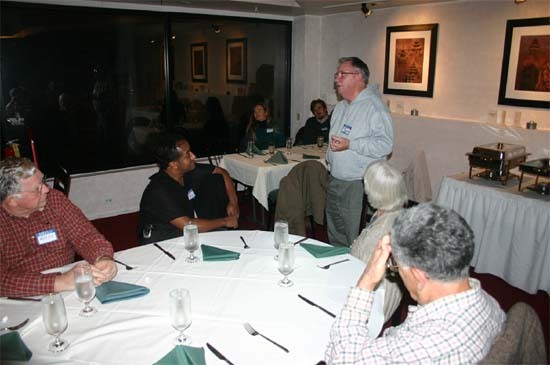 Lee Tuveson from Nepal 1 speaks to the Maryland Returned Volunteers at the group's ethnic dinner at the Nepali "Kathmandu Restaurant" in 2004 as Russell Faust, Kay Muldoon-Ibrahim, and Kamal Ibrahim listen. Read more about this event here. Sunday Pickens, Chris Seremet, and Lane Berk after one of the group's many "Habitat for Humanity" projects in downtown Baltimore. JoAnna Allen organized our first Habitats and later Chris Seremet took over the organization of these successful service events. Read more about this event here. 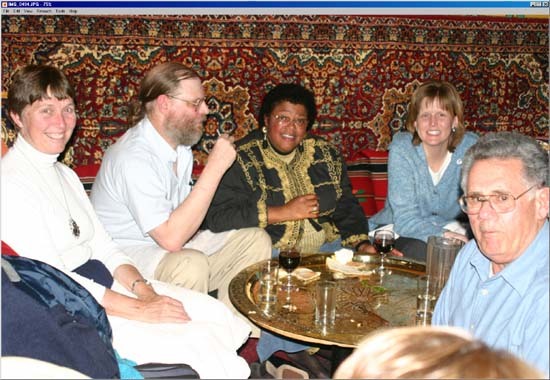 The group's ethnic dinner at the Moroccan restaurant "Casablanca" in Wilmington Delaware in 2003 with Summer Rosswog and Kamal Ibrahim (right). 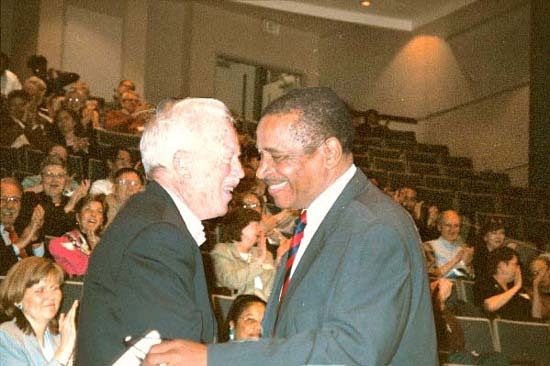 C. Payne Lucas, founder of Africare, speaks at the group's third annual Peace Corps History series at UMBC. Since its founding in 1970, Africare has delivered more than $450 million in assistance on 2,000 projects to 36 countries Africa-wide. Joby Taylor, head of the Peaceworker Program at UMBC, organized this event and it was one of the best events the group ever sponsored. Read more about this event here. RPCVs Kay Muldoon-Ibrahim, Brian Dulay, and Tracey Feild enjoy themselves at one of the group's happy hours at Sean Bolan's restaurant in Federal Hill. Now it is time for us "oldsters" to start stepping aside and let the next generation of RPCV leadership have it's day. 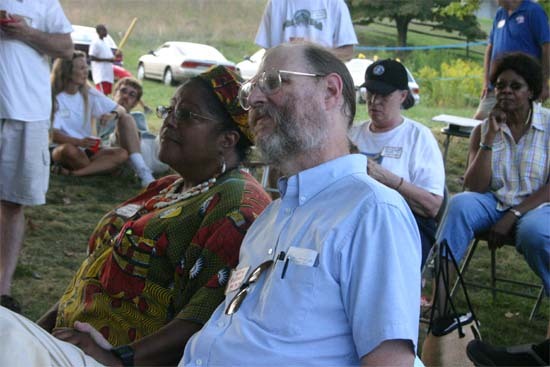 With upcoming leaders like Joby Taylor (above at the 2005 picnic), Director of the PeaceWorker Program at UMBC and organizer of the last two "Peace Corps History" series at UMBC with Scott Stossel and C. Payne Lucas, we know that the future of the Maryland Returned Volunteers is in safe hands and will be able to sustain itself and move in new directions in the future. So as we depart from our leadership role in the Maryland Returned Volunteers and move on to new challenges we just have two things to add. I love you Sunday. Thanks for the memories! 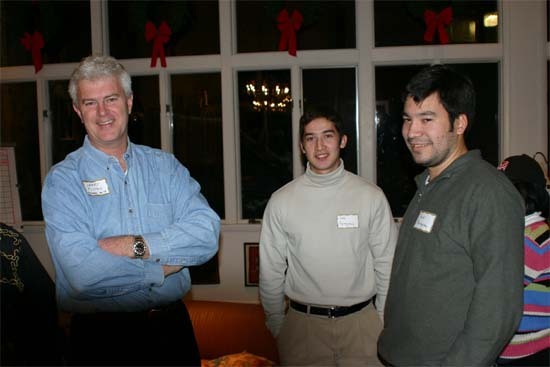 Caption: Larry Fitton shares a story with Luis Camacho and Jose Camacho at last year's Holiday potluck. Mark your calendar for our first event in 2006 - our Annual Holiday Potluck on Saturday January 28 at the home of Larry and Nancy Fitton (43 Glen Alpine Road, Phoenix MD 21131) starting at 6 pm. This is a potluck. Everybody bring a dish to share. 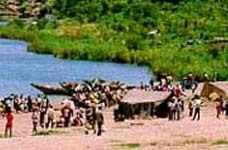 Members are encouraged to bring Peace Corps slides to show the group. A dish to share (appetizer, main dish, dessert) ethnic if possible, with serving utensil. Bring something to drink: a two liter soft drink or juice. We will furnish paper plates, napkins, and eating utensils. Our nominee for Vice-President is Zachariah M. Brevis who served as a volunteer in Armenia. He has an MPA from GWU and is working for the US Courts as a Management Analyst for the federal public defender program. The position of secretary is still open. Please send an email reply to this address if you are interested. The first meeting of the newly elected Board of Directors will take place at the Shriver Center at 6 pm on Thursday, February 2. For detailed directions click here for directions to the UMBC Campus under "Directions and Parking." Then click here for a map of the campus. 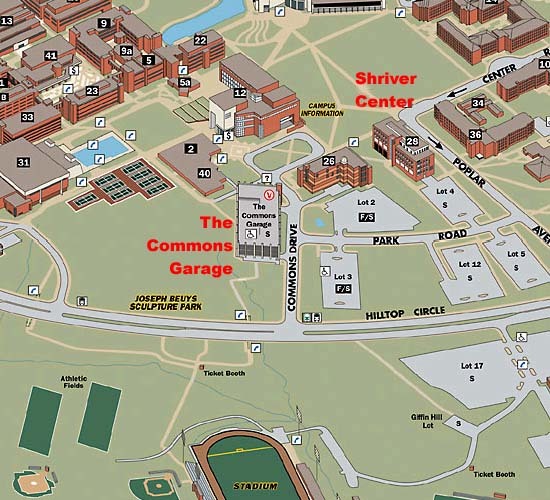 We will be meeting in Room 107 of the Shriver Center (called Public Policy Building or Building 28 on the map). Park in the commons garage.